Dozens of Chinese naval vessels are exercising this week with an aircraft carrier in a large show of force off Hainan island in the South China Sea, satellite images obtained by Reuters show. 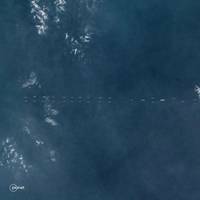 The images, provided by Planet Labs Inc, confirm a Chinese carrier group has entered the vital trade waterway as part of what the Chinese navy earlier described as combat drills that were part of routine annual exercises. The Liaoning carrier group last week traversed the Taiwan Strait, according to the Taiwanese defense ministry. 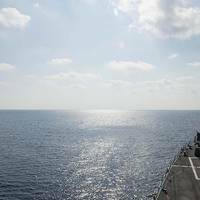 Is Beijing Outflanking the US in the South China Sea? 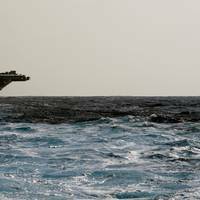 For much of the last week, the U.S. aircraft carrier Carl Vinson has been patrolling the South China Sea. It is just the kind of display of Washington’s power and global reach that the U.S. Navy excels at – both to reassure allies and, in this case, send a message to potential foes. How much longer Washington will be able to perform such operations unchallenged, however, is an increasingly open question. Some military experts project that within a little more than a decade, China’s People’s Liberation Army Navy may have more warships than Washington under its command. China's Defense Ministry said that a patrol by a U.S. warship in the South China Sea on Friday was "illegal" and "provocative" and that it had lodged a protest with the United States. 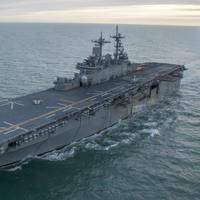 In a statement on its website, the ministry said two Chinese warships had warned the U.S. warship to leave during the patrol. 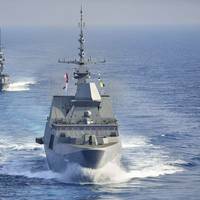 It added that the Chinese military would increase air and sea patrols according to need. U.S. defense officials said the guided-missile destroyer USS Decatur challenged "excessive maritime claims" in a patrol near the Paracel Islands, among a string of islets, reefs and shoals over which China has territorial disputes with its neighbors. The Chinese Defense Ministry said two warships, the Guangzhou and the Luoyang, warned the U.S. vessel to leave. Permanent Court of Arbitration ruling set for July 12. An international court said it would deliver a hotly anticipated ruling in the Philippines' case against China over the South China Sea on July 12, drawing an immediate rebuke from Beijing, which rejects the tribunal's jurisdiction. The United States, which is a close ally of the Philippines and is concerned about China's expansive South China Sea claims, reiterated its backing for The Hague-based Permanent Court of Arbitration and urged a peaceful resolution of the dispute. Manila is contesting China's historical claim to about 90 percent of the South China Sea, one of the world's busiest shipping lanes. A Chinese naval intelligence ship was spotted off Japan's Boso Peninsula in Chiba Prefecture, Jiji Press reported quoting the Defense Ministry. The vessel did not enter the country's territorial waters, Japan's Defence Ministry said, but added it is rare for a Chinese naval vessel to sail back and forth in that area near Tokyo. Maritime Self-Defense Force P-3C patrol aircraft spotted a Dongdiao-class intelligence-gathering ship sailing northeast in waters outside the contiguous zone surrounding Japanese waters southeast of the peninsula around 3:30 p.m. Wednesday. China has shown "great restraint" in the South China Sea by not seizing islands occupied by other countries even though it could have, a senior Chinese diplomat said on Tuesday ahead of two regional summits where the disputed waterway is likely to be a hot topic. Beijing has overlapping claims with Vietnam, the Philippines, Malaysia, Taiwan and Brunei in the South China Sea, through which $5 trillion in ship-borne trade passes every year. Reclamation work and the building of three airfields and other facilities on some of China's artificial islands in the Spratly archipelago have alarmed the region and raised concern in Washington that China is extending its military reach deep into maritime Southeast Asia. Two huge explosions tore through an industrial area where toxic chemicals and gas were stored in the northeast Chinese port city of Tianjin, killing at least 50 people, including at least a dozen fire fighters, officials and state media said on Thursday. At least 700 people were injured, more than 71 seriously, the Tianjin government said on its Weibo microblog, and the official Xinhua news agency said two fires were still burning. Wednesday night's blasts, so large that they were seen by satellites in space, sent shockwaves through apartment blocks kilometres away in the port city of 15 million people. Internet videos showed fireballs shooting into the sky and the U.S. Geological Survey registered the blasts as seismic events. Chiness president Xi Jinping promised a “thorough investigation” after huge explosions in the world’s 10th largest port- Tianjin - killing at least 50 people and disrupting operations. The Chinese government faces pressure to reveal the mystery chemical or explosives. The cause for the blasts is being investigated by China while top foreign and local companies are assessing the damages caused to them. A team of 217 nuclear and biochemical materials specialists from the Chinese military began work at the site on Thursday, the official Xinhua news agency said. The Chinese navy has announced 10 days of military training in the waters near eastern Hainan Island in the South China Sea starting on Wednesday, amid heightened tensions in the region. Playing down the significance of the exercises, the Chinese military said the drills, started yesterday in the east of Hainan Province, are not directed against neighbours. "The drills are regular military exercises scheduled in the annual plan, without targeting any other country," the Ministry of National Defence said. Japan called on China on Tuesday to halt construction of oil-and-gas exploration platforms in the East China Sea close to waters claimed by both nations, concerned that Chinese drills could tap reservoirs that extend into Japanese territory. Japan's Defense Ministry added the demand to its annual defense review after hawkish members of the ruling party complained that its original draft was too soft on China, a ministry official said. China resumed exploration in the East China Sea two years ago, the report said. In 2012, Japan's government had angered Beijing and purchased a disputed island chain there. Before then, Beijing had curtailed activities under an agreement with Japan to jointly develop undersea resources in disputed areas. China has launched regular military exercises in the Yellow Sea and the Bohai Strait, says the Chinese People's Liberation Army's Daily, the Chinese military's official newspaper. The China's military newspaper reported that eight days of "military missions" had begun on Friday in the northern parts of the Yellow Sea and the Bohai Strait, adjacent to the Korean Peninsula. Until next Friday, China's maritime authorities have banned ships from sailing in the affected areas. The brief report did not give details, including the purpose of the drills or how many troops were mobilized.